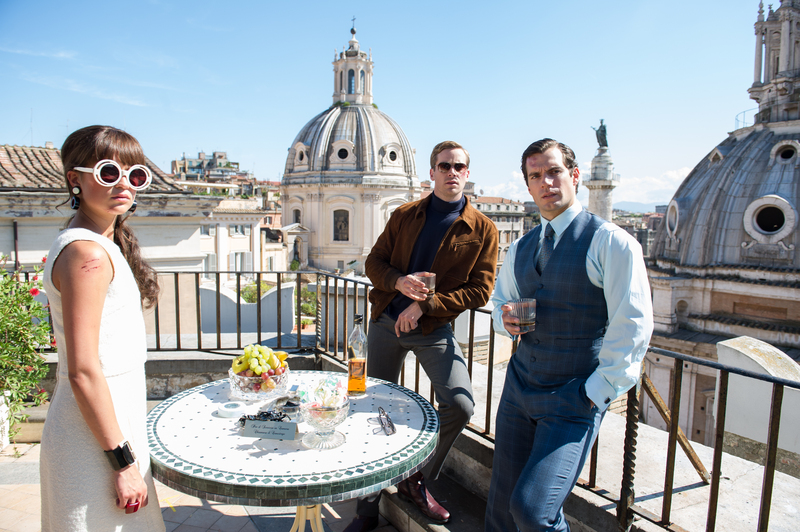 (l-r) Alicia Vikander as Gaby, Armie Hammer as Ilya and Henry Cavill as Napoleon in THE MAN FROM U.N.C.L.E.. ©Wanrer Bros. Entertainment. CR: Daniel Smith. Based on the ‘60s Cold War TV series, “The Man from U.N.C.L.E” tells the origin story of two super spies from the East and West and how they are brought together to bring down a mysterious criminal organization that has its sites set on getting control of a nuclear warhead. Despite their political and personal differences, Ilya Kuryakin of the K.G.B. and Napoleon Solo (played by “Superman” star Henry Cavill) of the C.I.A. are forced to cooperate in this top-secret mission. 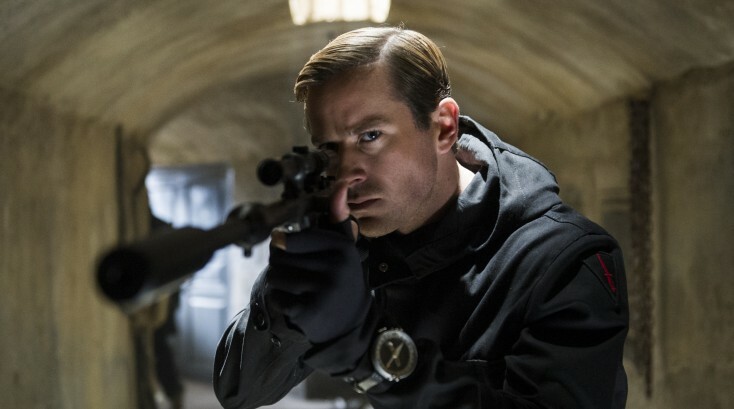 The 28-year-old actor recently spoke about being part of the reboot of the classic spy series, playing a Russian agent and working with director Guy Ritchie. Q: This TV series was running well before you were born so when you took on the role was there something you felt you had to pay more attention to? Hammer: Yes and no. Anytime you approach a property that has been done before or has a dedicated fan base, people who really enjoy it or remember it nostalgically, you want to be careful and tread lightly because you want to make those people happy but we’re doing with this one is try to make those people happy but packaging it in a way where if you don’t have that past of watching it as a kid, you can still go to this movie and understand what’s going on and appreciate the characters whether or not you know who Mr. Waverly (played by Hugh Grant) is or not. We were cautious and careful but at the same time, knew we were doing something new. Q: Did you had to find a happy medium with the Russian accent so you didn’t sound like you were doing a parody of one? Hammer: Yeah. I think what I was trying to do with the accent was try to sound as authentic as possible. If you go back and watch American film, especially from the ‘60’s, ‘60’s and ‘80’s, every Russian is an arch (villain) character. They are Boris from “Rocky and Bullwinkle.” They are like “Natasha!” That’s not really how Russians speak. They were a bad guy so they thought they should sound like a bad guy. That wasn’t what I was aiming for. I really just wanted to sound as universally Russian as possible. Q: So you have an American actor playing a Russian and a British actor playing an American. Which one do you feel closest to? Hammer: That’s kind of the fun of acting. You get to play all these different roles that really have nothing to do with you and it gives you liberty to be crazy with your art so you can be conservative in your life. Q: Did you come up with your own backstory as to where Ilya came from? Hammer: It’s kind of a boring actor story but he was basically raised in the heart of Soviet Russia. His father was in the military but did something [politically dishonorable and was sent off to the Gulags like millions of Soviets at the time. So Ilya was dealing with the shame of that and also, he was a physical specimen chosen from a young age and put in training and schools where they were breeding him to become a super spy. School where you mess up and they whip ya. That’s why he doesn’t have any other ambitions other than to be the best spy he can be. He isn’t worried about going home to eat a beautiful plate of risotto with truffles or line his pockets during a mission. He is just there to do the mission. That’s why there is an even more fun rub between the two of our characters. Q: Did you watch any episodes of the original TV series to prepare for your role? Hammer: I did watch the original series. I didn’t necessarily do it to learn any parts because David McCallum played the part of Ilya Kuryakin and he did a great job but it was a specific role at a specific time for a very specific show which was very different from the movie we’re making now. The bones are similar. The characters are the same but it’s a very different show than our movie so there wasn’t really anything I could pull off of it. More of less it was to give myself the historical context and understand why we’re making this movie. Q: Do you see coming back for a sequel? Q: Playing it straight and not slapstick must have been difficult. Hammer: You had to find the truth in the situation or it could get very slapsticky and you would be the goofy Russian guy who is all thumbs and doesn’t know how to talk to this person. It would be very easy for that to get caricatury so you had to find the truth and find why he can’t deal with that person. Why is he socially inept and what is the cause of that? Play it like it’s not funny. Q: You have to come into this with the influence of many spy movies you have seen. Which one influenced you the most? Hammer: I don’t know that there was one movie parse that was influencing me. I would be hard-pressed to pick my favorite spy movie to be perfectly honest. I think tonally, what we were doing was so different from anything I’ve ever done or seen except maybe work that Guy’s done before but we were on a very new path so like Henry said, we just trusted Guy. Q: There is a lot of physicality in the movie, especially in your fight scenes. It’s been said you had to run for three days straight chasing that Henry on foot while he’s driving off in a car. Tags:armie hammer, Guy Ritchie, Henry Cavill, spy movie, The Man from U.N.C.L.E.